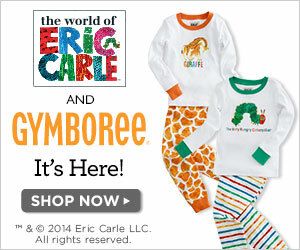 Gymboree invites kids to play all day and dream all night in its new limited edition play and sleepwear collection featuring the World of Eric Carle. Children love his books and now they can wear his art! Thanks for the information! Are these events only in the US or in Canada as well? I hope this event is global :) Wishing to join some, to obad Philippines is way our of the picture.. I love those tops. Super cute. I wish there was a Gymboree closer to us. The hungry caterpillar was my favorite book as a kid! Super cute shirts available. I like this article you have, its a great information for parents to buy clothes for their children. These are so completely lovable and adorable. I would buy each of them! These are so cute. I loved shopping at Gymboree when my son was little. I really like Gymboree. As soon as weather changes, I'll need to get the boys some new clothes! These shirts are adorable! I'm sure children will love them! My kids loved Gymboree when they were little. And I think we read Brown Bear Brown Bear about a million times. We even learned the song. Those clothes are really cute.! I will have to check these out. I have always heard good things about Gymboree clothes. Too bad we missed the event. These Eric Carle shirts are definitely on my rave list. I used to read The Very Hungry Caterpillar to my nephew every night. Oh my goodness, I clicked over and they have adult jammies too. Same kind. Ha! I think these are awesome! Great illustrations. Wish I could wear them! I've never heard of gymboree. I'm glad they're celebrating Eric Carle, he's a great author! I love this collection. His books are so awesome! i bet eveyone enjoyed the event last sept 5! would love to see the design myself too! wish i can check it out too! Love these! Will have to grab a few for my little ones. We love Eric Carle. My kids love Brown Bear, Brown Bear so much that they would probably spazz if I picked up a couple shirts. If only they came in my size too! I love this! Heading to Gymboree! These outfits are so cute and perfect for young kids that love the books! I would totally buy these if my kids were younger. Went to gymboree over the weekend and got an outfit for my nephew who is due in 5 weeks! When my kids were younger, we had gymboree parties. A pj party would have been fun.